Sorry but the window proved impossible for me to photo. The short verse by Lt Sales was scratched onto the window. The etching was on a hut window in what is now industrial estate. The hut was one that was being renovated by the Westgarths (Westgarth's Garage) & Cyril Westgarth ensured that the pane was carefully removed. 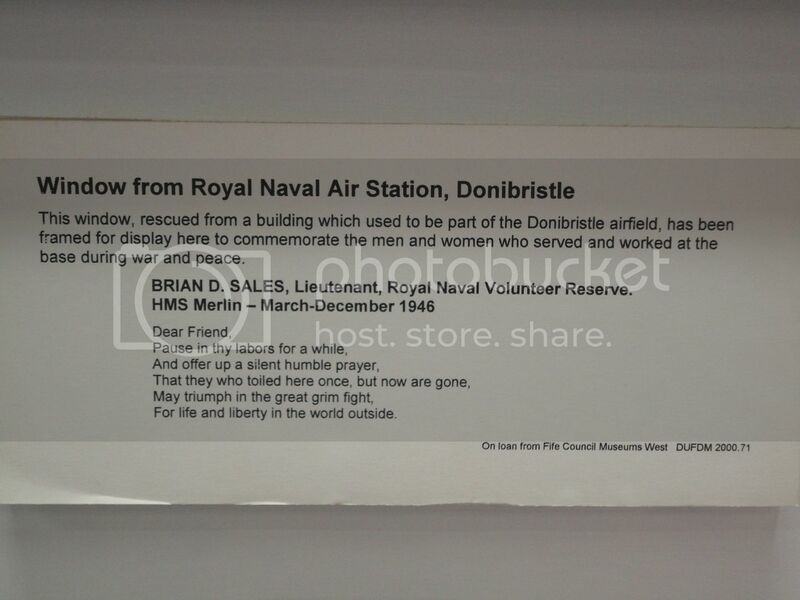 At my suggestion it was framed & hung in D/Bay Library where there already were on the walls enlargements of some of the old Donibristle photos that I had collected. Nothing is known about Lt Sales. Son of Jack Eric D. Sales (1901-1996), and Edith Turner. Married ((03? ).1947, Liverpool district, Lancashire) Winifred Swarbrick; one son, one daughter. Makes you wonder if his children are aware of it.